Common Human Resources (HR) tasks like screening resumes, conducting interviews, and matching candidates was once a manual, tedious process. Technology and Artificial Intelligence (AI) are transforming talent acquisition and expediting the recruiting and hiring process. Although Artificial Intelligence and recruiting technologies can streamline the hiring process, the human connection is still essential in building cohesive and successful teams. How AI is transforming the recruiting process. Building successful teams often start with a commitment to hiring the most qualified candidates. It also begins with a mutual commitment between an organization and staffing company. In this eBook, you will learn how to transform your hiring practices and find candidates that help your team grow and succeed. 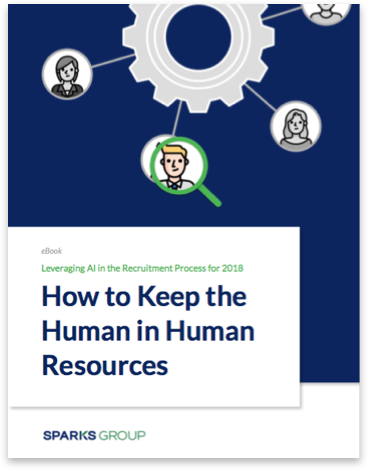 Complete our form to download our free eBook and learn how your company can leverage the powers of artificial intelligence in recruiting, while still keeping the “human” in HR to engage and hire top talent.